Okay, so it’s been quite a while since I’ve updated. While I have some interesting travel posts to discuss, I’ll start with a bunnyblogging post. …In which Noe does not appear. She’s shedding right now, and looks pretty mangy as a result (not literal mange, not to worry). But she’s not her usual sleek and sparkly self. So today, I have some photos of a rodent, which is at least similar to a rabbit. 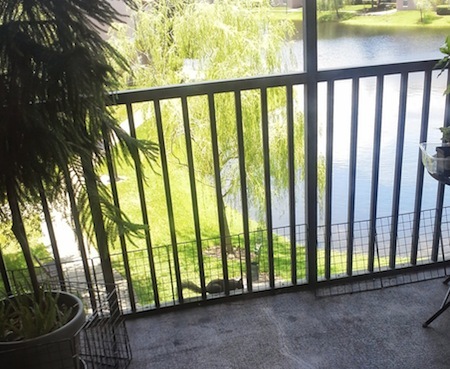 This is a squirrel who’s been climbing precariously on the outside of our patio screens for the last few weeks. It’s precarious because we’re on the third floor. While I don’t really want the little beastie clambering all over and doing who knows what, I don’t have the heart to scare it and make it fall off. So I’ve been shooing it away quietly. 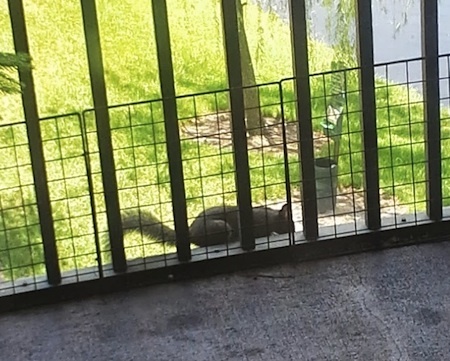 This incident was a bit of a first, because the squirrel was licking something off of the patio ledge. No idea what it was. Pretty gross. Neither the squirrel or Noe (who was napping under the chair) were really too bothered by my presence.